Hooray for bulk discounts passed on to us! 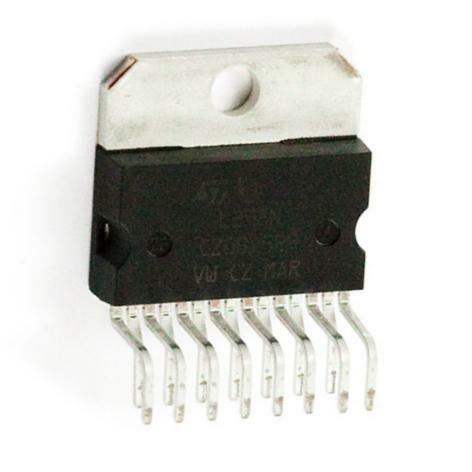 You sell the IC's but not the required diodes and hard to find low resistance, high power resistors. FYI The above YouTube link is dead. Just about everyone who buys this will need some matching schottky diodes. How about stocking either some discrete diodes, or even better an integrated bridge like an ST L6210? The diodes aren't required for driving stepper motors are they? The diodes are required for any inductive load, so yes you will. The 6210 is not a bridge - it's just an array of 8 Schottky diodes. 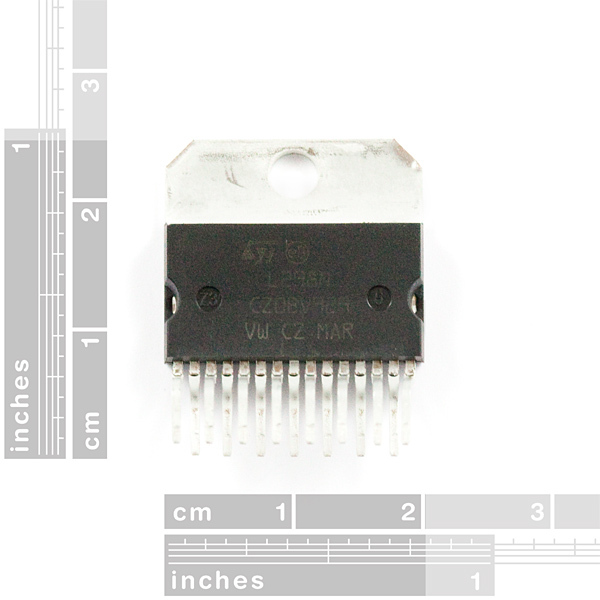 Perhaps you are thinking of the L6201 which is a single H-bridge with integrated diodes. But I'm still loyal to the LM298. I've Used them in my Mobot and a few prototypes. Is the "peak" current synonymous with "inrush"? I have an actuator that has approximately 300 ms startup draw of ~10A, but under load is only pulling ~1.2A @ 12.6V. I don't know what kind of tolerance or suppression this package has, but those are the parameters I'm trying to accommodate. Looks cool; but while the data sheet indeed says 46VDC, and 2A continuous per channel, it also says 25W TOTAL dissipation. If that is per device not per channel, I interpret that to mean that if you are running at (for instance) 12.5V, you get 2 amps total to work with for continuous power, not 4 amps continuous; and to get 4 amps continuous, you'd have to be running at no higher than 6V and a 46V you'd be limited to around .5A total for both channels (all of which might be just fine for your app) but definitely NOT 46V continuous at 4A (184W). But I've never even played an electrical engineer on TV, so am I misinterpreting this? "The external bridge of diodes D1 to D4 is made by four fast recovery elements (trr â¤ 200 nsec) that must be chosen of a VF as low as possible at the worst case of the load current. " into "buy this part number diode for a 12V motor between .5 and 2A, this p/n diode for 24V 4A," etc. (This is why I'm still using LMD18200s with all that integrated :-). Thanks! It looks like the LN298 is only rated to operate at -25 C. I'd like to use it at -40 C. Is it likely to work, or can I somewhere get one of these rated for lower temps? I use 24Volt on a L298N i get 12 volts on 2 motors using 100% duty cycle.Is this normal. Shouldn't i get 24Volts for each motor output?Also if i stop one of the 2 motors i get for all the voltage to the one that is working. Often the terminal voltage of a so-called "12 V battery" will get dragged down to 6 V (or lower!) when it's connected to a motor trying to move a heavy load. Test: If you wire both motors directly to your "24 V" power supply (replacing the L298 with some wires), do you see the same 12 V? If so, the L298 is working as designed; that is normal. (Although you may want to consider getting a higher-current power supply). Love this chip, and it's hard to beat this price. I've written a tutorial on using this IC, with Arduino code, here. Also, with a little bit of bending, these fit nicely into a breadboard! Does anyone know if a bi-directional transient voltage suppressor diode between the motor poles could replace the diodes? Any chance SFE will sell the L297? Okay, will this work with pwm signals from arduino??? I'm thinking of pulsing the enable pin. Do you need the 4 diodes they have in the datasheet to run a motor? Can I use 3V TTL with this? And what kinda diodes do I need for this? No on the 3v ttl. You'll need to level shift it somehow. you can use the level shifting board available here, or there are ways to use a 5v pull up with a 3.3v logic system (you'll need to understand resistor voltage dividers), and you then just use your controller chip to pull the inputs low. Use a high voltage diode, I'd say 200v peak reverse bias. General purpose schottky or silicon diodes are fine. Fast switching would be good. you'll see very high, but very short lived currents through it. 3.3V does work. As the datasheet says "logic high minimum 2.3V". I'm using these with a Rover 5 controlled by a 3.3V Propeller. Here's a link to the project. Whoa, thanks for the fast response, it's me that was slow in checking my comments for replies. Is it okay to use 1000V rectifiers for the 'iodes? I've never really understood what the difference is between zeners, rectifiers, and schottkys. And how can I get me one 'o them pull-ups? I need to step up a voltage without inductors and I will only have a 3V power source. Shouldn't say "Breakout board comming soon", when it's already here. Puzzled. Soldered this to corresponding breakout board. Hooked up to 12 volt Battery pack as source and regulated Power supply as logic with no load. Absolute value of voltage in one direction was about 1.2 volts higher than the other on both sets of outputs (i.e. -10.5 volts vs + 9.3 volts). Is this expected or a bad chip or am I missing something? Are you absolutely sure you didn't put it in backwards? if I hooked up four of these in parallel will I get 16 A to drive my 16 Amps DC load (boat motor) ? You'll want to use 5 or 6 or maybe 8. 4A is a maximum that will cause you problems if you plan on running at 100%. anyone know what the pitch is? - good news guys, glad to see this old fellow put to good use. As a source of inspiration, check out the Solarbotics compact motor driver (also using L298). Working on it. We'll post it with the breakout board when it comes out.